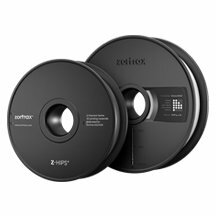 Z-HIPS spools for Zortrax 3D printers. Z-HIPS is a thermoplastic polymer with high impact resistance. It is mainly used for designing formworks for different types of equipment, starting with electronic equipment housings, or casings for industrial machinery. Z-HIPS filament also has very good post-processing properties such as gluing, painting, smoothing and sanding. Z-HIPS filament spools are Zortrax-compatible and available in many different colours. Our buying guides are all available online to help you choose the best material to print according to your requirements. The best prices direct from the manufacturers for Z-HIPS spools are at Makershop3D. Got a problem? Feel free to contact us.